Progress can be hard to measure at times but I'm just finishing week five and beginning to see some real signs. 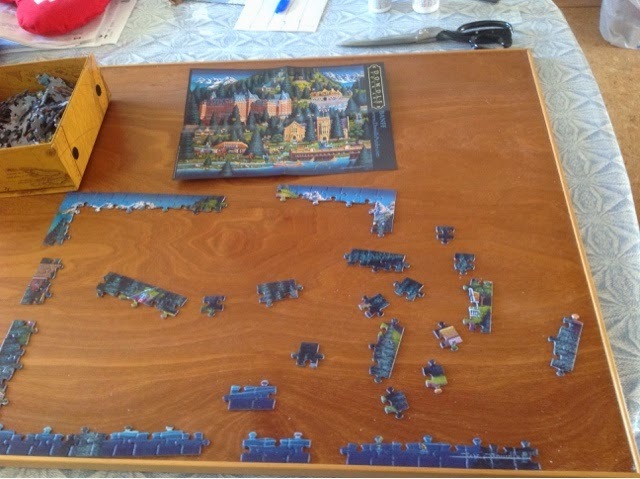 I've made two puzzles and ths morning started the third. While they are only 500 pieces each, they are fairly challenging...or at least the right level of challenge for the moment. We have had such unseasonably warm weather that the streets are now bare and dry. Getting totally bored with laps round the central fireplace, I asked Doug to walk outside with me. I probably pushed a little further than I should have, but we made it all the way to the corner and back. Unfortunately it is still winter, so it took nearly as long to get dressed with warm coat, boots, gloves and sunglasses as it did to walk! But there was a brisk breeze so warm gear was required, along with my Buddy in case of coughs or sneezes. Still haven't heard from the cardiologists office. I need the all clear from him/her before I can ramp up the activity, although I think I might be ok to start hemming. I will see how I feel tomorrow. Week five is now well underway and I'm finally feeling as though significant healing is happening. Still a ways to go, but I'm hoping to get the all clear on the sternum healing so I can start to do some hand work. The weather has been unseasonably warm and people are talking about an early spring. Thing is we can still get cold weather in March. So I'm not holding my breath looking for early blooms. 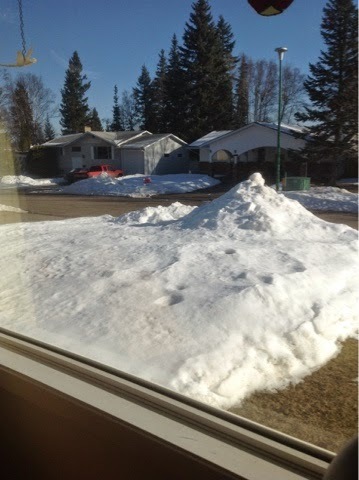 But the level of the snow has gone down considerably. Currently reading The Beat Goes On by Ian Rankin. Collection of Rebus short stories. Tomorrow marks the end of week four which will put me 2/3s of the way through the first six weeks of healing. It has been a slow journey...and it isn't over yet. I remeber when I broke my ankle how I assumed that at the end of six weeks I would be up and at 'em. The reality was that the end of six weeks was just the beginning of 'recovery'. The good news is that there is significant progress. I can go longer between doses of pain killers, I'm sleeping better and things just generally seem to be settling down. The reduction in the beta blocker dose helped my energy levels but I think it needs to come down again. When I went in to hospital I was taking 12.5 mg per day; when I left I was taking 150 mg a day. I'm hoping that things continue to be stable and that I can reduce that further next week. The incisions are healing nicely and bothering me much less. The bad news is that my left hand is taking a very long time to stop being numb so typing is still difficult...which means I'm mostly doing the hunt and peck thing on the iPad. Thank goodness for the Internet and wifi! 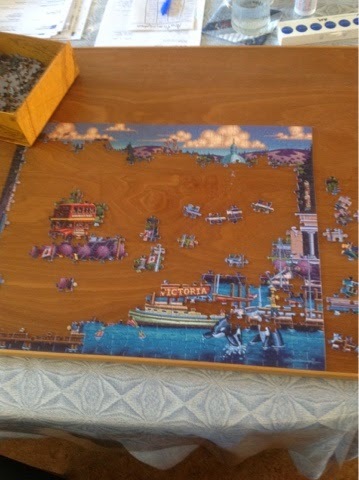 Finally felt well enough to set out a small jigsaw puzzle and between surfing the net and reading, the days trickle by. Two thirds through the first bit. Not much longer until it is over. Well, the first bit, anyway. After days and days of grey days, many with freezing rain, Mother Nature has seen fit to grace day one of the Canada Winter Games with sunshine. It is still too warm for February, but the appearance of the sun is very welcome. It looks like the weekend will be quiet, more reading, perhaps a jigsaw puzzle will be set out. Recovery from this surgery is multi-staged. The first milestone is getting the bone healed. In order to do that the staff stressed that no more than 5 pounds be lifted and to keep any loads close to the body. No reaching for anything of any weight. If the sternum doesn't heal properly - well that's not good and extreme measures need to be taken. And you essentially wind up at square one and start recovery all over again. Since I really don't want to wind up going down that road I am being good and not doing anything that will stress the sternum. That includes handwork. Today I reached the half way mark of the first six weeks. While every day is a tiny bit better than before I'm a ways from the first milestone, let alone the parts that come once the bone has healed. Like breaking my ankle...once the bone was healed the real recovery had to begin. I have no illusions about being able to leap back onto the loom at six weeks, one day. I had hoped to be weaving by week eight, but that is just a hope. Reality may present something quite different. Then there are the unexpected adverse effects...minor in the larger scheme of things, but annoying nonetheless. Visits from friends have helped distract me from the grey dreary days and the slow ticking of the clock. I'm feeling well enough to read and today we went to a local Indy bookstore where a very generous gift certificate was waiting for me. I scored four more books to add to my reading pile. I'm hoping to feel more alert tomorrow because Dr gave permission to start reducing the beta blocker. 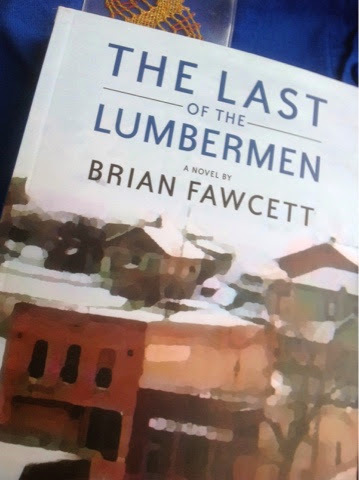 Currently reading The Last of the Lumbermen by Brian Fawcett. 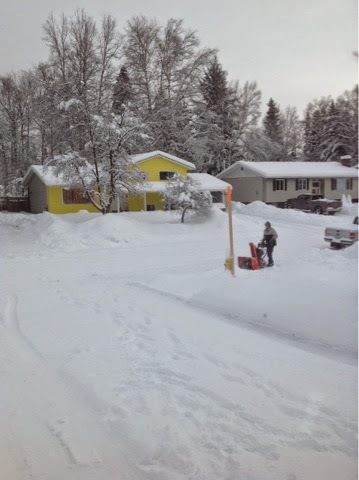 Fawcett grew up in Prince George and has used the town as a setting before. This time he called it something else but it's a pretty thin disguise. I've had some fun with it identifying some of the locations. February has to be the most difficult month. We are in the dead of winter. 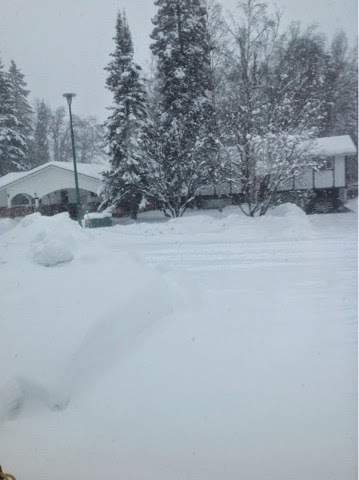 Snow is piling up, grey skies. My usual coping mechanism is to hie myself to the loom and work on something with saturated colour to counteract the fifty shades of grey. This year I can't. So I am trying hard to focus on the subtle beauty of the monochromatic view out the window, the sculptural shapes of the snow bound trees. In the meantime Doug is the one dealing with moving it from here to there. A steady flow of friends, either in person or on the phone or Internet has provided much needed gentle distraction. Every day sees a tiny step forward in healing. Recovery will be a multi-stage process with several milestones to be reached. The first is the six week mark when hopefully the sternum will be healed. Once that has been accomplished physio for the muscles will commence. For now I am working on the second third of the first six weeks. Time does not stand still although its passage definitely feels relative. But the days do end, another day gets crossed off. I set myself conservative daily goals which I don't always meet, but at least I do try. As a friend reminds me, almost daily because I need to hear it, the most important thing is healing, all else can wait. But I still need to set my goals because I also need to stay focused on what comes after recovery. Life is a process and this experience is all a part of it. We live in amazing times. So many of my family members simply died from cardiac disease. I get another chance. Besides, I've got all that yarn to use up! 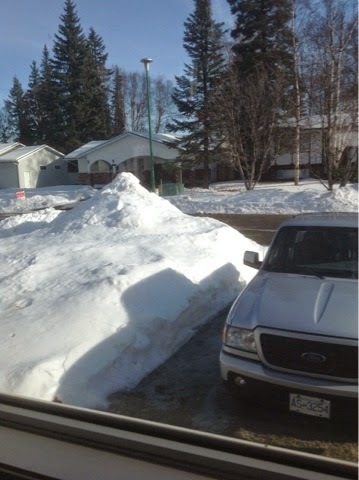 It was supposed to be 'light' snow today, continuing over the next couple of days. Instead we have near blizzard conditions. I like to have A Plan. Makes me feel as though I have some control when I have one, or three. In preparation for recovery I prepared. A lot. Not just mentally, but did stuff so that I would have lots of stuff to work on to keep myself occupied. Unfortunately, much of the handwork I expected to be able to do is not recommended for the first six weeks. The sternum has to completely heal before any stress is put on it and lots of hand and arm movement might compromise that. So my bobbin lace, hand hemming and even the gentle bit of weaving that I thought I could do? Nope. Thinking about doing the Olds Master Weaver Program? As I am a student in the Olds College Master Weaver Program, others who are thinking of doing it ask me what it is like. I can only speak for myself. I have been a life-long learner, by nature and by profession. If you are thinking of doing Olds, you are probably of a similar frame of mind. I’m not going to make an argument for why you might want to do it. I’ve already done that in the Jan/Feb issue of Handwoven. Here are some things to think about. You do have to be a weaver who is not averse to sampling. I know a number of people who never want to weave anything that does not have a direct, immediate use. I challenge this simple definition of useful. “Useful” is not a thing in itself. Nothing is just useful; it is always useful for a purpose, and its definition at any given moment is tied to that purpose. For example, a sleying hook is a very useful tool for getting warp ends through the reed. But it is not useful for baking cakes, doing open-heart surgery, chopping wood, or probably anything else. Samples are like that. They are very useful for checking sett, testing colours, calculating shrinkage, trying different wefts, etc. In the classroom at Olds we do samples to make sure we know what the instructor is explaining and that we understand what her expectations are for our homework assignments. We sample to learn how sett affects density and integrity of cloth. We sample to learn to sample. So sampling is always useful because it teaches us something, it answers our questions, it raises questions we had not expected. I learn the usefulness of sampling at Olds and I never see a sample as a waste of time. Sampling is useful. This takes us directly to number 2. We have to think about weaving at Olds. This is the source of learning. This is what makes it fun for me. But I like to think about things; I can get a big thrill out of a little learning. We don’t just sample, measure, wash, re-measure and move on. We learn to analyse a series, analyse colour relationships, examine design principles, etc. Basically, we learn how to think as a weaver, ‘think’ being the operative term here. You can weave for forty years and not know much about weaving itself. You can probably make a mean tea towel and gorgeous scarf. I’m sure your edges are memorable. But do you have the theoretical background to understand an article outside your regular structures, or analyse a piece of weaving you would like to reproduce? For example, I have just done my overshot homework. 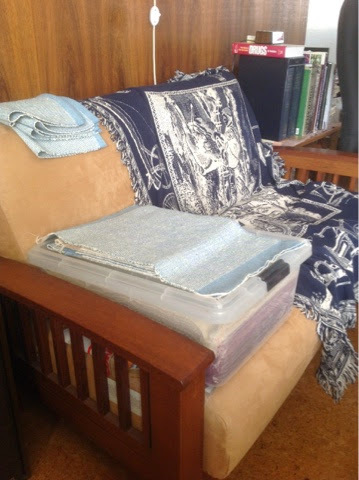 Previously I have done a number of overshot pieces and I had no problem following a draft and weaving it. But after the classroom teaching at Olds and the need to understand it at a theoretical level, I now find overshot way more interesting and I am motivated to explore more advanced overshot such as double-weave overshot and tied overshot. Now I have the theoretical knowledge to be able to read that information and understand what writers are saying to me. We do paperwork for all our homework assignments. In class we learn how to do the planning, the calculations and the drawdowns. I feel this is one of the most valuable parts of the programme. Completing the Record Sheets makes us slow right down and think about what we are doing. This mental activity is a great gift to the mind. When one does the paperwork, it is possible to explain to others how to reproduce a piece. It is possible to understand, ourselves, what we have done. Yes, it is possible to race on to the next project and never write up anything. Indeed, if you just follow the recipes in Handwoven, you will never have to think again. Because a structured programme like Olds requires paperwork of me, I must reflect upon what I have done, and this makes me a more thoughtful weaver. I feel it in my head; I’m getting smarter. 4) Completing the homework assignments. I know that some people are concerned once they go back home after the intensive week that they will lose motivation to complete the homework assignments. This is where structure reinforces best intentions. The binder we receive each year is a teaching instrument; we have gone through it page by page in class, we have done the samples. We are set up for success, not failure. If new questions come up when doing the assignments, I have found my instructors to reply with a meaningful answer within a very short time. I feel I am connected to my instructor and to my classmates: I have met with them, laughed with them, heard their stories. We are all in this together, and everyone wants everyone else to finish. Our Level One class set up a closed Facebook page so that we could encourage each other. We are in different provinces and states, yet we share a common goal. This sisterhood sustains us. It is so terrific to meet weavers from all over the continent: it expands our weaving community. It would be good for a few people in an area to do the programme together, like a study group, meeting regularly, even if they are at different levels. This would help everyone to complete each assignment and each level. I know that different people find different aspects a challenge. These are four points I can think of right now that could deter someone from committing to a programme of study such as the Olds College Master Weaver Program. You have to decide for yourself what is right for you. I hope you will consider joining us. We are now officially in the February blahs. Although it did quit snowing for a bit, it was overcast and grey. 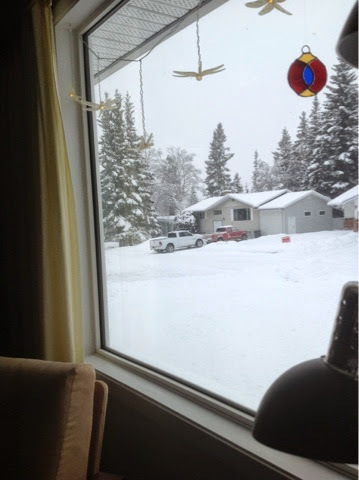 Today the wind picked up out of the North and the snow came again. Recovery progresses, in a two steps forward, one step back kind of way. This morning I felt very low in energy, but my brain seems to be beginning to function again. A little. Enough that I've felt able to read. I finished the book I started on the bus to Vancouver, then picked up Susan Hill's Betrayal of Trust. I have not read all of the books she's written but enjoy them when I find them. Unfortunately much of the activities I had planned to do during recovery are not recommended. Or at least not right away. Mostly I will have to monitor my progress and let my body dictate when I feel able to do much of anything. A couple of friends have taken us in hand, providing food and gentle distraction. Time to just let the body do what it needs to do. And hold on to the promises of renewed health and energy after healing and recovery are done.